In a briefing today on Capitol Hill, University of Pennsylvania biomedical engineer and neurologist Brian Litt outlined requirements for harnessing promising research for patients suffering from brain disorders. 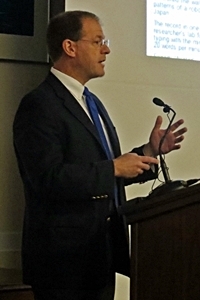 The briefing in Washington, D.C. was organized by the journal Science Translational Medicine and its publisher American Association for the Advancement of Science. Litt, who is on the faculty in both Penn’s medical and engineering schools, conducts research on epilepsy, particularly the connection between the brain and devices to monitor and treat epilepsy. In addition, Litt licenses his lab’s research for development of products through collaborations with makers of medical devices. The focus in Litt’s lab on advanced research, coupled with an eye on practical applications of that research, resulted in the Food and Drug Administration last week granting pre-market clearance to a device to treat epilepsy, based on Litt’s research. The device is an neurostimulator implanted in the brain and made by NeuroPace of Mountain View, California. To make these advances possible, Litt notes, takes the knowledge and skills of a variety of disciplines, and he cited his own lab as an example that includes neuroscientists, neurosurgeons, engineers, and biostatisticians. This “team science” approach says Litt is supplemented by collaboration over long distances, and boosted further by the experiences of women and under-represented minorities on his team. More recent and sophisticated monitoring tools can track brain activity in greater detail, showing more patterns of activity than had been known before, and as a result, allow for development of tools that can address disorders like epilepsy with potentially greater benefits for patients. Understanding those patterns of activity led to development of NeuroPace’s implanted brain stimulator that detects potentially troublesome brain activity and delivers small bursts of stimulation to reduce the frequency of seizures. As Litt notes, however, the NeuroPace system is still “a first-generation device,” with more improvements needed. He outlined a number of promising research tracks aiming to deliver finer wires for leads, smaller chips, and flexible devices for implantation. In addition, research in Australia with 15 patients, reveals a better understanding of the disorder. In this case, people with epilepsy experience many more seizures than they report, since many of the seizures occur at night, often interrupting their sleep. All of these developments suggest, says Litt, that disorders addressed by neurotechnology take more than the efforts of one lab or company, and require more collaboration and sharing of data. A recent development making collaboration easier is the International Epilepsy Electrophysiology Portal, funded by National Institutes of Neurological Disease and Stroke, where Litt serves as one of its principal investigators. The portal, which opened in June 2012, provides a platform for its 11 member institutions sharing data, tools for managing and processing the voluminous data sets, and expertise between researchers. The portal runs on the Amazon.com cloud service, needed because of the high volume of data collected and processed, and added MATLAB algorithm development tools this past summer. In addition to advances in the treatment of epilepsy, says Litt, neurotechnology is making significant advances in devices today, such as cochlear implants for people with hearing disorders and retinal implants to enable rudimentary sight for the visually impaired. In addition, motorized prosthetic devices that respond to neurosignals, while still relatively simple and expensive, are beginning to enter the market.